To extend our understanding of tear film dynamics for the management of dry eye disease, we propose a method to optically sense the tear film and estimate simultaneously the thicknesses of the lipid and aqueous layers. The proposed method, SDT-OCT, combines ultra-high axial resolution optical coherence tomography (OCT) and a robust estimator based on statistical decision theory (SDT) to achieve thickness measurements at the nanometer scale. Unlike conventional Fourier-domain OCT where peak detection of layers occurs in Fourier space, in SDT-OCT thickness is estimated using statistical decision theory directly on the raw spectra acquired with the OCT system. In this paper, we demonstrate in simulation that a customized OCT system tailored to ~1 µm axial point spread function (FWHM) in the corneal tissue, combined with the maximum-likelihood estimator, can estimate thicknesses of the nanometer-scale lipid and micron-scale aqueous layers of the tear film, simultaneously, with nanometer precision. This capability was validated in experiments using a physical phantom that consists of two layers of optical coatings that mimic the lipid and aqueous layers of the tear film. M. A. Lemp and G. N. Foulks, “The definition and classification of dry eye disease: report of the Definition and Classification Subcommittee of the International Dry Eye WorkShop (2007),” Ocul. Surf. 5(2), 75–92 (2007). M. E. Johnson and P. J. Murphy, “Changes in the tear film and ocular surface from dry eye syndrome,” Prog. Retin. Eye Res. 23(4), 449–474 (2004). 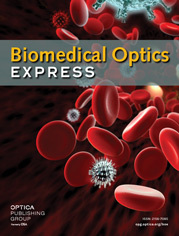 G. Rieger, “The importance of the precorneal tear film for the quality of optical imaging,” Br. J. Ophthalmol. 76(3), 157–158 (1992). S. C. Pflugfelder, “Management and therapy of dry eye disease: report of the Management and Therapy Subcommittee of the International Dry Eye WorkShop (2007),” Ocul. Surf. 5(2), 163–178 (2007). M. G. Doane, “An instrument for in vivo tear film interferometry,” Optom. Vis. Sci. 66(6), 383–388 (1989). N. Fogt, P. E. King-Smith, and G. Tuell, “Interferometric measurement of tear film thickness by use of spectral oscillations,” J. Opt. Soc. Am. A 15(1), 268–275 (1998). J. I. Prydal and F. W. Campbell, “Study of precorneal tear film thickness and structure by interferometry and confocal microscopy,” Invest. Ophthalmol. Vis. Sci. 33(6), 1996–2005 (1992). R. Yadav, K. S. Lee, J. P. Rolland, J. M. Zavislan, J. V. Aquavella, and G. Yoon, “Micrometer axial resolution OCT for corneal imaging,” Biomed. Opt. Express 2(11), 3037–3046 (2011). T. Schmoll, A. Unterhuber, C. Kolbitsch, T. Le, A. Stingl, and R. Leitgeb, “Precise thickness measurements of Bowman’s layer, epithelium, and tear film,” Optom. Vis. Sci. 89(5), E795–E802 (2012). R. M. Werkmeister, A. Alex, S. Kaya, A. Unterhuber, B. Hofer, J. Riedl, M. Bronhagl, M. Vietauer, D. Schmidl, T. Schmoll, G. Garhöfer, W. Drexler, R. A. Leitgeb, M. Groeschl, and L. Schmetterer, “Measurement of tear film thickness using ultrahigh-resolution optical coherence tomography,” Invest. Ophthalmol. Vis. Sci. 54(8), 5578–5583 (2013). H. H. Barrett and K. J. Myers, Foundations of Image Science (Wiley, Hoboken, 2004), Chap. 13. J. Rolland, J. O’Daniel, C. Akcay, T. DeLemos, K. S. Lee, K. I. Cheong, E. Clarkson, R. Chakrabarti, and R. Ferris, “Task-based optimization and performance assessment in optical coherence imaging,” J. Opt. Soc. Am. A 22(6), 1132–1142 (2005). A. C. Akcay, E. Clarkson, and J. P. Rolland, “Effect of source spectral shape on task-based assessment of detection and resolution in optical coherence tomography,” Appl. Opt. 44(35), 7573–7580 (2005). J. Huang, K. S. Lee, E. Clarkson, M. Kupinski, K. L. Maki, D. S. Ross, J. V. Aquavella, and J. P. Rolland, “Phantom study of tear film dynamics with optical coherence tomography and maximum-likelihood estimation,” Opt. Lett. 38(10), 1721–1723 (2013). J. Huang, E. Clarkson, M. Kupinski, K. S. Lee, K. L. Maki, D. S. Ross, J. V. Aquavella, and J. P. Rolland, “Maximum-likelihood estimation in Optical Coherence Tomography in the context of the tear film dynamics,” Biomed. Opt. Express 4(10), 1806–1816 (2013). P. E. King-Smith, S. H. Kimball, and J. J. Nichols, “Tear film interferometry and corneal surface roughness,” Invest. Ophthalmol. Vis. Sci. 55(4), 2614–2618 (2014). J. M. Tiffany, “Refractive index of meibomian and other lipids,” Curr. Eye Res. 5(11), 887–889 (1986). J. P. Craig, P. A. Simmons, S. Patel, and A. Tomlinson, “Refractive index and osmolality of human tears,” Optom. Vis. Sci. 72(10), 718–724 (1995). P. Tankam, A. P. Santhanam, K. S. Lee, J. Won, C. Canavesi, and J. P. Rolland, “Parallelized multi-graphics processing unit framework for high-speed Gabor-domain optical coherence microscopy,” J. Biomed. Opt. 19(7), 071410 (2014). Fig. 1 Schematic layout of spectral domain OCT in the context of the tear film imaging. Fig. 2 Customized spectral domain OCT experimental setup. Fig. 3 Experimental and theoretical PSFs. Fig. 4 (a) Histogram of the camera readings at one pixel (red envelope is a Gaussian curve with the mean and standard deviation of the counts distribution) (b) Relation between the output variance of the power spectrum and the mean value (D.N. : digital number); The data point in the red square of (b) is derived from the measurements shown in (a). Fig. 5 (a) Conditional log-likelihood that one measured spectrum is generated by different lipid and aqueous thicknesses; (b) Top view of the conditional log-likelihood in (a); (c) Conditional log-likelihood along the black line in (b) and the lipid layer thickness estimate; (d) Conditional log-likelihood along the red line in (b) and the aqueous layer thickness estimate. Fig. 6 Comparison of a measured spectrum (blue curve) and the predicted spectrum (red curve) from the mathematical model using the estimates. Fig. 7 (a) Structure of a two-layer phantom; Thickness maps of (b) the lipid and (c) the aqueous layers; Repeatability distribution of (d) the lipid layer and (e) the aqueous layer. Fig. 8 Estimation accuracy and precision for different thickness of (a) the lipid layer and (b) the aqueous layers. (6) P( N g | d l , d a )= 1 ( 2π ) M 2 ∏ x [ K N g| ( d l , d a ) (x,Δt) ] 1 2 ×exp[ − 1 2 ∑ x ( N g (x,Δt)−〈 〈 〈 N g| ( d l , d a ) ( x,Δt ) 〉 〉 〉 ) 2 K N g| ( d l , d a ) (x,Δt) ]. (7) ( d ^ l , d ^ a )= argmin d l , d a ( −log( P( N g | d l , d a ) ) ). (8) K Ng (x,Δt)= C 1 〈 〈 〈 N g ( x,Δt ) 〉 〉 〉 2 + C 2 〈 〈 〈 N g ( x,Δt ) 〉 〉 〉+ C 3 . (9) Δd= OPL n 2 Δn.